Lake Wilson has been stocked with over seventeen different species of fish. The most popular and tough-fighting of them all, the Peacock Bass or Tucanare was introduced in 1957 from South America. Known for its distinctive tail spot, it's considered by many anglers as the most hard fighting freshwater fish in the world! 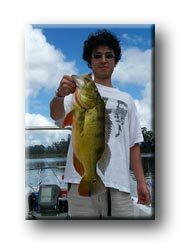 Hawaii, South Florida and Puerto Rico are the only places you'll find the peacock bass in the United States. The only native freshwater fish is the O'opu. Found in mountain streams, it was a highly prized food fish by ancient Hawaiians. Other freshwater sport fish have been introduced over the years... Large Mouth Bass, Small Mouth Bass, Bluegill, Channel Catfish, Snakehead (Pungi), Oscar, and Tilapia. Many unwanted aquariums have been dumped into streams and lakes in Hawaii. Red Devil & Paku are considered a pest by some anglers, and a great sport fish by others. Good or bad... many tropical aquarium fish are now well established in lakes and streams.